'Maybe Sincerity Is The New Punk': Chris Cornell On Embracing Space Cornell will never not be that guy from Soundgarden, but three decades after the dawn of Seattle punk, his life is in a different place — and his music has followed suit. 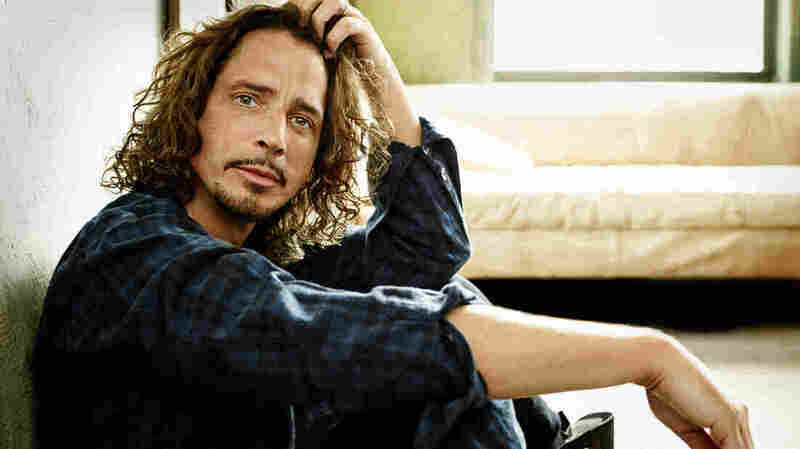 You know Chris Cornell from Soundgarden, but his new album, Higher Truth, is a solo project. Chris Cornell will never not be that guy from Soundgarden — and, consequently, his name will always evoke that messy, surreal and biting rock 'n' sound that band helped define. But three decades after stoking the flame that would become Seattle grunge, Cornell is at a different place in his life, and his own music has followed suit. The singer and songwriter's latest project is a solo album called Higher Truth. He joined NPR's Rachel Martin to talk about it. There is a kind of intimacy embedded in these songs that I don't think we've seen from you before. Tell me about the song "Let Your Eyes Wander," which is mainly just your voice and acoustic guitar. What makes that song, I think, is how stark it is. I said, "Let's take everything out and hear what it sounds like with just guitar and singing." And that was it. It never really got any better than that. Sometimes, if a song is written, in essence, to be that stripped down, it's very touchy when you start adding things, because even the smallest thing can have a huge impact. Somebody has to make the decision that there's a better song in there if there's less. For people who only know you from Soundgarden, this might be a surprising kind of sound — because there are some tracks on here that have more instrumentation, but on the whole it is a very stark, stripped-down set of work. In some way, did that expose you? Did that make you vulnerable in new way, to have it just be you, your voice and a guitar? Was that comfortable? Well, in the context of a whole album, it was challenging because this was the first time where I really had to think about it in that long a form. I've done plenty of songs where there's very little instrumentation, or it's just acoustic. The first one people probably heard was a song called "Seasons" that was on the soundtrack for Cameron Crowe's movie Singles. I think it was a surprise to people then. Did it bug you that people had put you in a box of sorts? Sort of! It shouldn't have. I knew that what Soundgarden was doing was special. I didn't know if I was able to do something special outside of that. We live in a pretty cynical time, and irony is laced into a lot of our pop culture. But some of the songs on here are just these straightforward, beautiful stories. They are not ironic. I'm thinking in particular of "Josephine," which is just a love song. Is that something intentional? Is there a part of you, in your process, that is challenging the trend right now? Well, I don't know: Maybe sincerity is the new punk. But to me, I think I have to connect with something emotionally, on some level, or I don't care about it. And if I don't care about it, then I don't think anyone listening to it will, either. Another song I wanted to talk about is the track "Murder of Blue Skies." I love this song because it not ironic, it is sincere — but I didn't think the lyric would go where it does. It's interesting, because lyrically, it's not particularly joyful. It's a song everyone will relate to, but I'm not really sure, emotionally, where it's coming from. I'm not really declaring myself in it, and the character that's singing it isn't really declaring himself in it — other than just saying, "I look forward to waking up without you around ever again." And that's not really romantic, but it's not really an empowering statement either. You're still recording with Soundgarden. Do you need both parts, the band and the solo projects, to make the whole? I would live without both parts. But it's a lot more satisfying to have them. It's great to still be having new experiences with the same group of guys — because we invented a band together, and kind of co-invented a genre of music. Being able to come back and experience being a band together at a different time in our lives has been really rewarding, but it's also just really nice to still share some part of my life with these people that have been so important to it.